An abandoned plant i found on the street, i love this shot. This was my favourite in the challenge. Forget the challenge - it's a geat image. I know I will always enjoy this one. Agreed, this was one of my favourites... I can't remember why I gave it a 9 instead of a 10. 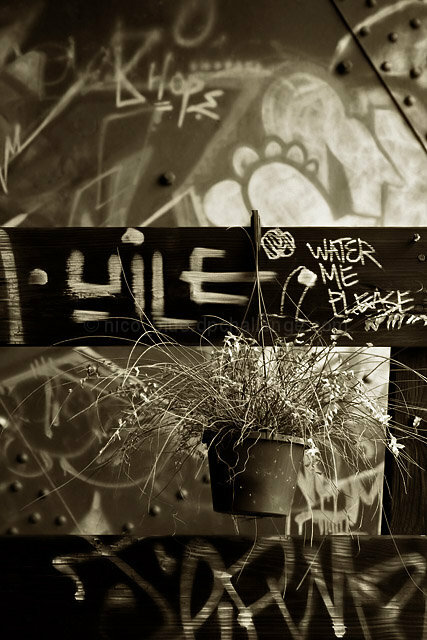 That "water me please" scrawl adds a little something extra. Message edited by author 2005-11-16 08:25:31. I like the way the graffiti stands out and seemingly speaks to you... Nice shot. Like the photo and it's a nice b&w. Wondering what it looks like in color. The background of the photo looks like it may be colorful and if so, it may make a more dramatic point to see a colorful background and a not-so-lively plant (though it looks healthy as a b&w). :) Nicely done though. Good luck. This image has a very striking appeal. I'm not sure why perhaps it's the way the writing gives a motion blur effect contrasting against the plant. Also I like the lighting good image allround. very different. i like the composition and the stark tones. This just made me smile. Great detail and composition. love this photo. like the street art aspect, like the color treatment, love the lines. one of my favorites in this challenge. very nicely done! Photograph is too busy.Maybe if it were just the potted plant and "water me please", it would get the point across without distraction. I love the tones. And it's funny and cute but with a classy feel. My favorite shot in the challenge. 10 and favorite. Proudly hosted by Sargasso Networks. Current Server Time: 04/19/2019 04:16:19 PM EDT.